When you know what the climate is like here in Assam, you realise this woman must be brave to work outside. Throughout my stay in the Jorhat region, the temperature varied between 35° and 38°C, while the humidity came close to 100%. Whatever the temperature, she rarely removes her wide-brimmed hat: it protects her from the powerful rays of the sun and also from the frequent and torrential downpours that can come at a moment’s notice. 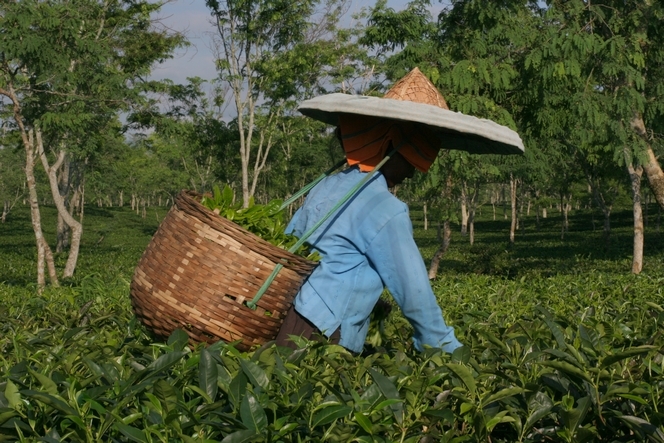 The yield per hectare here in Assam is four times higher than in Darjeeling, and totals two tonnes a year. Each tea plant produces such a quantity of leaves that between March and November, the shoots on each bush are plucked at least once a week. A record! 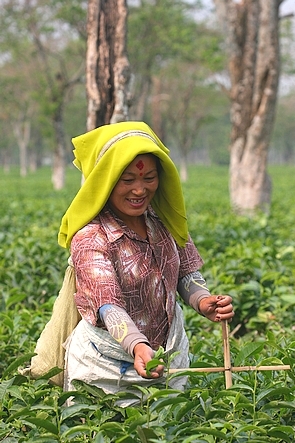 Yet this charming tea plucker on the Dufflating Tea Estate does not seem overwhelmed by the scale of the task; in fact she looks quite happy. 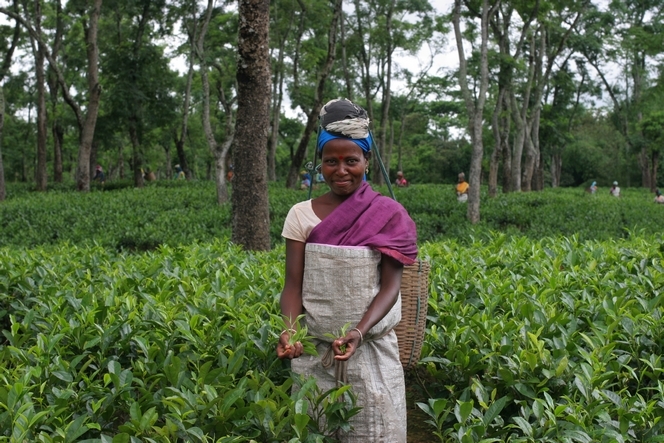 In the Dooars region of India, tea is often harvested by the people known as the Adivasis. Often despised by other Indians because they are right at the bottom of the social ladder, they benefit from positive discrimination, along with the lower castes. They don’t get much attention, which is another reason to talk about them here. The Adivasis are one of India’s biggest tribal populations. They descend from the aborigines and live in the north-east of the country. I took this photo at Meenglas, near Mal Bazaar, a few kilometres from the border with Bhutan. 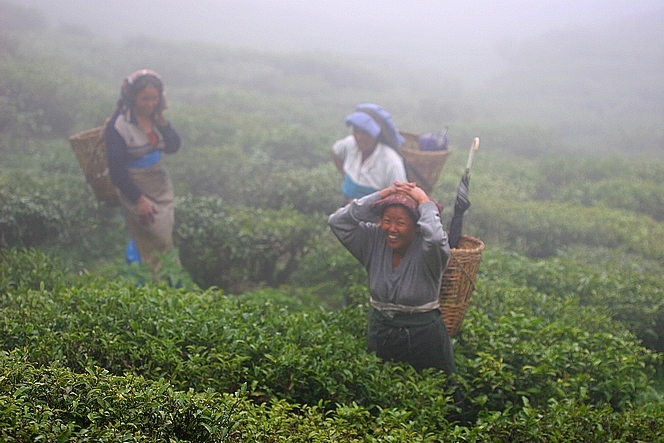 The Dooars region doesn’t produce very good quality tea, but that’s not important here. It was the smiling faces of these workers that I wanted to tell you about, not the rather coarse leaves filling their bags. 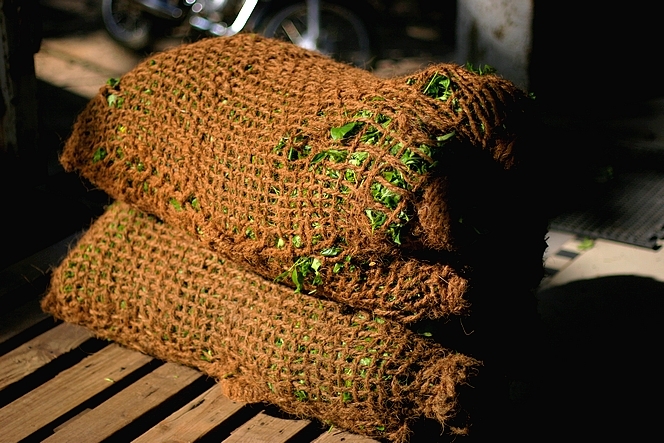 The harvesting of leaves used to make Pu Er is interesting. 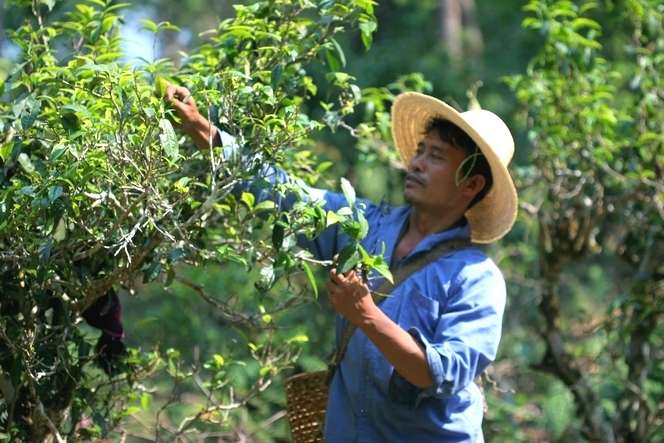 Here, in the west of Yunnan near the border with Myanmar, the tea plants are left in a semi-wild state, and the plucking consists of a walk through the forest. 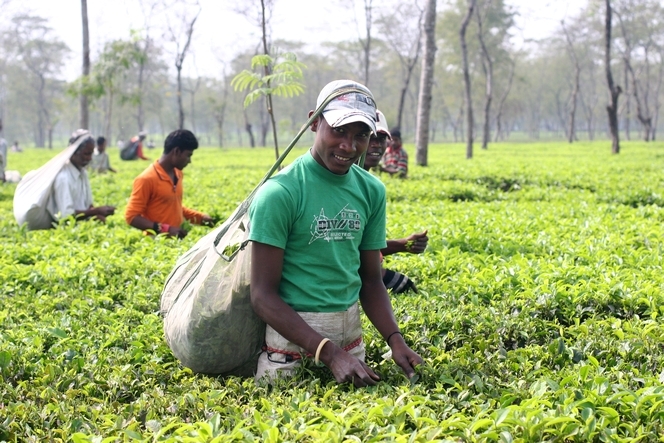 Instead of keeping the tea plants cropped at a convenient height for harvesting, as is usually the case, they are left to grow into trees, or always have been, and the workers walk around them to pluck the bud and the next two leaves, as is the practice with all other teas. 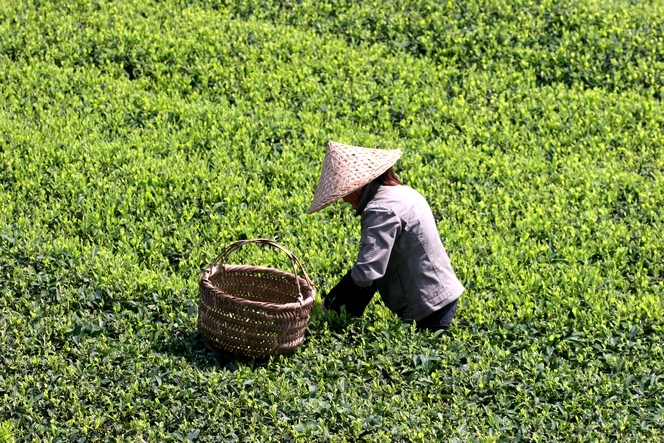 Plucking tea, practically leaf by leaf, is a major undertaking. In some countries, pickers carry baskets on their backs to hold the leaves. These baskets have an open weave to allow the air to circulate inside and prevent the leaves from fermenting, which would spoil the pickers’ hard work. There are several clues to the fact that I took this photo in Nepal: the man’s attire, particularly his hat, which is the kind worn by many Nepalese; the house with its ochre finish halfway up the mud walls, and the white sections picked out by the darker lines; lastly, for those who’ve spent time on the tea plantations, the shape of the basket itself, which becomes square as it widens at the top, and exists only in this region. 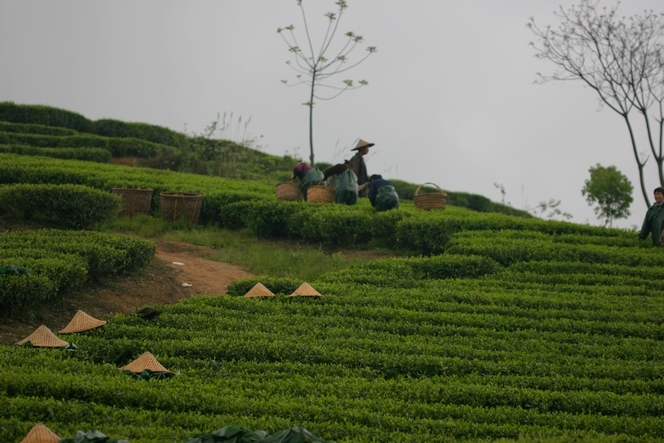 This scene took place near Phidim, in the far north of Ilam Valley, in the easternmost part of Nepal (Kanchenjunga Tea Estate is nearby; the Nepal Green Tea Factory and the Himalayan Shangri-La Tea Factory are a little further away). Nepal remains a largely rural country. Here, two hours’ walk from the nearest village, people obviously need to do everything for themselves. They weave in front of their homes, without becoming distracted by the stranger taking photos of them. What a beautiful warm evening light illuminating these string bags filled with fresh tea leaves. This is happening in Dellawa (Sri Lanka). In a few minutes, these leaves will be taken to the top floor of the tea factory where they’ll undergo the first stage of processing: withering. A stage that can take up to 20 hours for this type of black tea and consists simply in remaining the leaves spread out in thin, long and well ventilated trays. Water will thereby be taken out of the fresh tea leaves.